This school year, giving back to your school can be as easy as looking for the Red Spoon on your favorite Betty Crocker® dessert mixes, the only brand in the baking aisle with Box Tops. Whether you’re collecting for new computers, library books, or a playground, through the Box Tops for Education® program you can help make a difference. Last year, your contributions earned more than $59 million for America’s schools! Now, you can find Box Tops for Education on all Betty Crocker baking mixes*, including new Fun da-middles™, individual cupcakes with a fun, creamy center. This back-to-school season, look for double Box Tops on specially marked packages of Betty Crocker baking mixes. My kids love being able to take their Box Tops to school. It is so important to me because I know that it is teaching them the importance of helping their school out. It is a fun way to work together with my children. We like to find products with box tops so they can take to their classroom. I loved receiving my Betty Crocker Kit because the items were so cute! 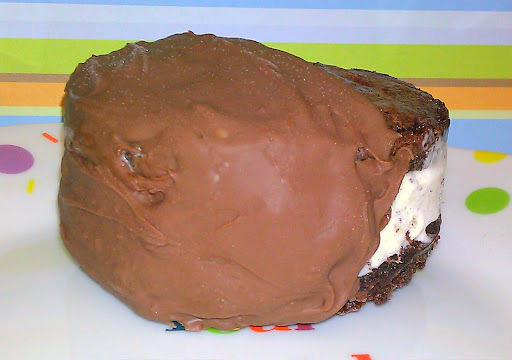 I was able to use my brownie mix to make delicious Deluxe chocolate Dipped Brownie Ice Cream Sandwiches. You can few the recipe HERE! Giveaway ends 09/29/2011 at 11:59 (PDT). Winners will be chosen via random.org and will have 48 hours to claim their prize. US only. Winner will be posted on blog – if an email is given, they will be contacted. Disclosure: The Betty Crocker products, information, and giveaway have been provided by Betty Crocker through MyBlogSpark.